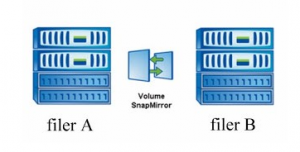 SnapVault vs SnapMirror – what is the difference? The first idea that poped out to my head was that snapmirror is mainly set on volume level, where snapvault is on qtree level. But that is not always the case, you can easily setup QSM (Qtree snapmirror). The key to understanding the difference is really understand the sentence: Snapvault is a backup solution where snapmirror is a DR solution. What does it mean that SnapVault is a backup solution? What we can do with snapvault? as a backup solution, we can have a longer snapshot retention time on filerB, so more historic data will be available on filerB, if filerB has slower disks, this solution is smart, because slower disk = cheaper disks, and there is no need to use 15k rpm disk on filer that is not serving data to the customer. What we cannot do with snapvault? in case of an disaster within filerA we cannot “set” filerB as a production side. We cannot “revert the relationship” making the qtree on filerB as a source, and make them read/write. They are snapvault destinations so they are read-only. What does it mean that SnapMirror is a DR solution? What we can do with snapmirror? if there is some kind or issue with filerA (from a network problem, to a total disaster) we can easily reverse the relationship. We can make the volume or qtree on filerB, as a source, and make it read-write, provide an network connection to the customer and voila – we are back online! After the issue has been solved we can resync the original source with changes made at the destination and reverse the relationship again.